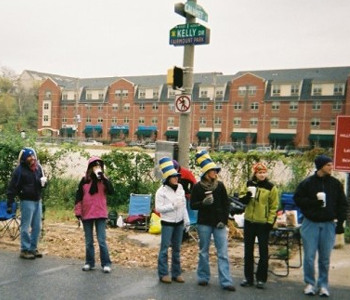 Several Rebels ran and many others cheered on the runners at our spectator location at miles 18 and 22 on Kelly Drive. 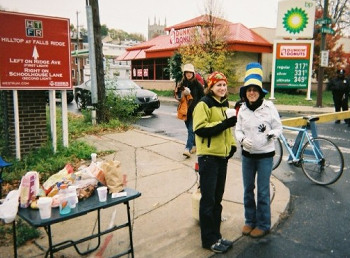 Even Shaggy and Party Girl encouraged runners after completing the JFK 50 miler the previous day. 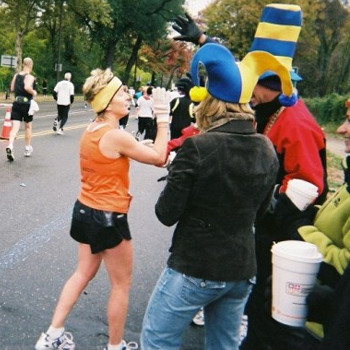 First, I want to say congratulations to the other Rebels who ran in Philly - both JFK and the Marathon. Lots of new accomplishments this weekend! Second, I want to thank everyone who was at mile 18/22 - you don't know how much knowing you would be there and then seeing you helped me. And thanks to whoever opened my gel for me and gave me water! Mile 18 was the highlight of the marathon for me - well, except for crossing the finish line. I had a great time on Sunday. It was an amazing experience. And I am still having a hard time believing I ran 26.2 miles! I just want to share with you a few things that stuck out in my mind that day. 1. If one person told me not to go out too fast you all told me - so I tried very hard to run an easy even pace - somehow that's pretty much what I did since it took me just over 2 minutes more to run the 2nd half of the race than the first. 2. I talked to myself more that I ever have in my life - it's crazy what you tell yourself to keep going. 3. 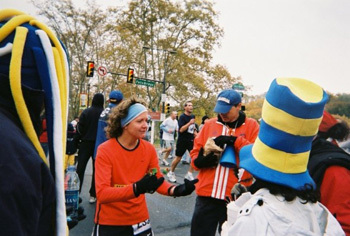 Barbara provided the best pep talk of the race at mile 22 - Thank you!!! 4. 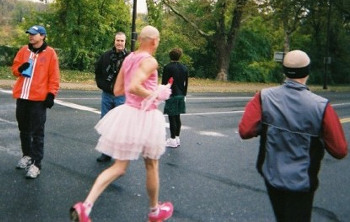 I passed Dwayne Christy at about mile 24 which gave me a little extra spring in my step - I know it's a shallow comment. 5. I am so glad I wore my name on my shirt - I will be a better race spectator now because I know how much I appreciated the support from all the people I didn't know. And the back of my shirt got a couple of laughs toward the home stretch. 6. And yes, if you all are wondering, I will run another marathon - just not sure when - my legs are still a little stiff. Thanks again for everyone's support. I couldn't have done it without all of you. Running has given me nothing but positive experiences in life and Sunday was just another example. I love you guys!! (and I've only had a 1/2 glass of wine tonight!!) Hope everyone has a great Thanksgiving. Heather- AWESOME 1st Marathon!!! And it wasn't even really fair weather! And you really didn't take that long getting out of the car yesterday! Hope you're recovering nicely today. Now you're a VIRGIN no more!! Andrea- WAY TO GO, BQer!!!!!! An 11 minute PR!!! See you in Boston!!! Right Linda!!??? Wes- Way to stick it out. You know you're crazy for doing all those marathons in a row, what was that, 3 in 7 weeks???!!! Hope you heal quickly. Darlise- Congrats for having the courage to try. Hope you hurry up and get better. Smarties- Congrats on GREAT 1/2 times!! Especially your Mom and her friend!!! PG & Shaggy- 50 miles!!!!! WOW!!!!!!!!!!!! Congratulations! Next, THANKS to all you guys for coming up to watch us. I know it wasn't the best of weather for you but, it was absolutely FABULOUS for me!! You have NO idea how looking forward to seeing you guys motivates you. REBELS REALLY DO ROCK!!!!!!!!!!!!!!!!!!!!! This was DEFINITELY MY MARATHON!!!!! I didn't think it was possible to have a better day than my BD 2 yrs ago, but this one was! Weather was perfect for me. Felt good driving up, a little nervous because I knew I was probably going to push it. Started between the 3:30 and 3:40 pace groups, manly b/c I was wandering around looking for Dar at the start. Started out doing 8:25/min miles and kept picking it up. Was a little concerned at my 1/2 time of @1:48 but still felt good and running very comfortably. Decided then that if I still felt this good when I saw you guys at 18 that I was going to put it all out there and push my limits and not worry about how fast or slow my miles were- just run as I feel. Of course I walked thru the beer stop (so I didn't spill any) at 19, cruised in and out of Manyunk, and couldn't wait to see you guys again at mile 22. I was getting sooooo excited at that point b/c of how I felt(especially after just coming out of Manyunk!) and the time that was showing on my watch. The only time I felt anything but good was around mile 24 when my knees started aching a little. Then I got to mile 25 and just couldn't wait to finish so I just ran, passing people, yelling at anyone walking at that point to just get it done!!! Crossed the finish line, stopped my watch on 3:35:45, and just started crying! An almost 9 minute PR! I couldn't believe it!!!!!!!! 8:14/min miles! I have trouble doing that in a 5k! But what I'm most proud of(outside of my finish time) was the fact that I had a NEGATIVE split!!!!!!!!! 1st 1/2 was 1:48:21. 2nd 1/2 was 1:47:22, 59 seconds faster!! And those 59 seconds are all because of the REBELS!!!!!!! You guys really are the BEST!! I've never even DREAMED of a run like that! I always thought it would be fantastic to do the Open Women's qualifying time of 3:40 at my age! Thanks again everyone for inspiring me to have THE RUN OF MY LIFE!!!!!!!!!!!!!! Lori Loco - ummmmm, where did that name come from again, Jack?????? I had no idea what to expect. What do you do for training for something 6 weeks after the last marathon? I didn't believe anything anyone told me. I was uncertain about putting myself through this again in the first place, worried about sporting an extra 5 pounds, little injuries bothering me, burned out from an extended season, and anxious about the goal in general. It would feel horrible if I tried again and didn't make it. I didn't tell too many people I was doing this. I only started getting excited when I went to the expo and met the pace team leader, Star. She was awesome during the race�she yelled the entire time. Telling us the strategy, encouraging, how we should be feeling, what to do on hills. But the problem was they led us too fast for most of our opinions. We were already 2 minutes ahead at mile 5! It was neat being part of a pack and finding camaraderie. The best part about being with them was not stressing out looking at my watch every mile and doing the math. Just keeping an eye on the balloons was reassuring. I enjoyed the course much more than I did 3 years ago. 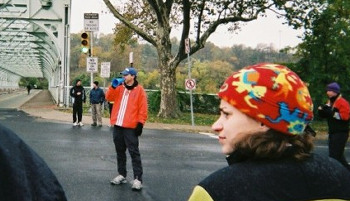 And the parts of it I can't stand during the Philly Distance Run were actually ok. The first few miles are incredibly crowded through the narrow city streets. I think it was worse for us in the pace groups because we were so concerned about not losing the balloons that we were unintentionally elbowing each other and stepping on feet. There were four significant hills. Slowing down on them was part of the pace leaders' strategy for speeding up so much in those early miles. The crowds were loud and supportive, but not nearly as many people as usual. It was rough weather for spectators. For me, 40 degrees, windy, and sprinkling was nothing to complain about after the 90 degrees, blazing sun and humidity we had in Chicago. There were a lot of "do-over" marathoners from the Chicago race there. My friend Adam found me at mile 7 to pace me. Some of the best advice was not to worry so much about being right up there with the pace group because I needed to conserve energy and I still had a time cushion. Having someone to chat with, or at least listen to, was helpful. As was someone to grab water for me and wait while I dashed into the woods and help me catch up. Besides the normal aches and pains, I felt great the whole way. I kept thinking back to Chicago where I was miserable at mile 12 and so many people were walking. I've never felt so strong at 20 miles-- not even during training runs. I really had something left to kick it in the last six point two. Seeing Mike at 15 and then my Rebel Runners at 18 and 22 was so encouraging. A great moment was when Barbara took my hand and ran a few yards with me, yelling to me that I was going to qualify, and the coffee in her other hand was spilling all over the place. 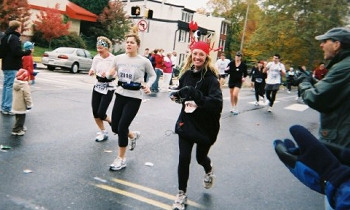 As far as friends in the race, I did see Lori coming out of Manayunk as I was going in. She looked great and I yelled for her. (Lori ended up with an awesome 3:35!) Around 23 I spotted a Deep Blue top and knew it was Peg. We came up on her and I had little speaking energy so I nudged Adam to say something to her. We cheered each other on and then kept going. Even at 23 I felt strong. I was breathing harder, but didn't feel like I was going to die. And my legs still worked by changing my stride a little bit. 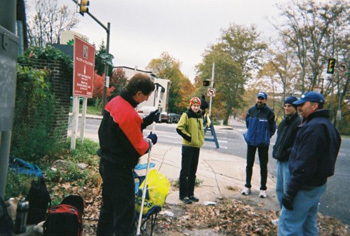 At 25 Mike jumped in, with his backpack and all, and encouraged me through until the barriers were up just before 26. Having the two of them on either side was great. But I couldn't respond or smile or acknowledge at that point. I came upon and eventually passed my pace group. Star saw me come up and recounted my success story to the pack about missing my goal in Chicago and here I was making it. That was cool. 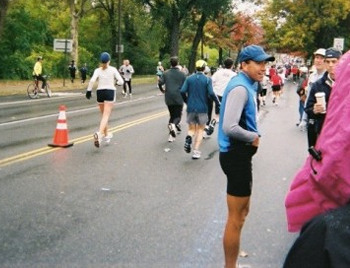 And I loved the lady on the sidelines who said "All you 40 year-olds are going to Boston!" After that I just gave everything I had through the finish. There were two girls in front of me, so the camera may not have picked up the arms in the air, huge smile and jazz leap over the finish. Checked my watch� 3:48:09!!! I was so emotional; I hugged a strange woman who looked motherly. Two minutes later, Mike found me and I really let the tears of joy flow. Boston, I am wicked psyched! !